We recently took a Spring Break trip to West Texas with my sons' scout troop. A six hour drive from Austin will bring you to a countryside that is not only very beautiful but is also filled with things to do. Located close to Fort Davis in West Texas, the Davis Mountains may be one of Texas' best kept secrets! You will find scenic views of mountains that seem to just pop up from the surrounding Chihuahuan desert. We did not stay in the State Park but in a Boy Scout camp close by. But the landscape was very similar. It is amazing the amount of life scurrying around; we saw a fox, wild turkeys, innumerable cows, wandering goats and more. In the middle of the dry Texas desert is an oasis of cool water perfect for swimming, snorkeling and even SCUBA diving. Located in Balmorhea Texas, the state park has a small motel and campsites available for rent. There is also a re-created wetlands complete with bird viewing on site. My husband and I went to Balmorhea many years ago when we were both newly certified divers. Twenty years later, we returned with the kids. Since we went during spring break, the out-of-water temperatures were cool, but the spring water was a steady 76 degrees. In the early morning, the park was mostly empty. There were a few divers finishing up their certification and one or two brave lap swimmers. The boys, in jackets, spent the morning just piddling around and looking at all the fish in the water. But as the sun got higher in the sky, all the boys suited up in their wetsuits and went for a swim! With the sun straight above, my older son and husband donned their dive gear to get up close and personal with the fish. The deepest part of the pool is only 20 feet, but there is still plenty to see. Below is an excerpt from their dive! Located an hour and a half north east of Balmorhea State park is Monahans Sandhills State Park. 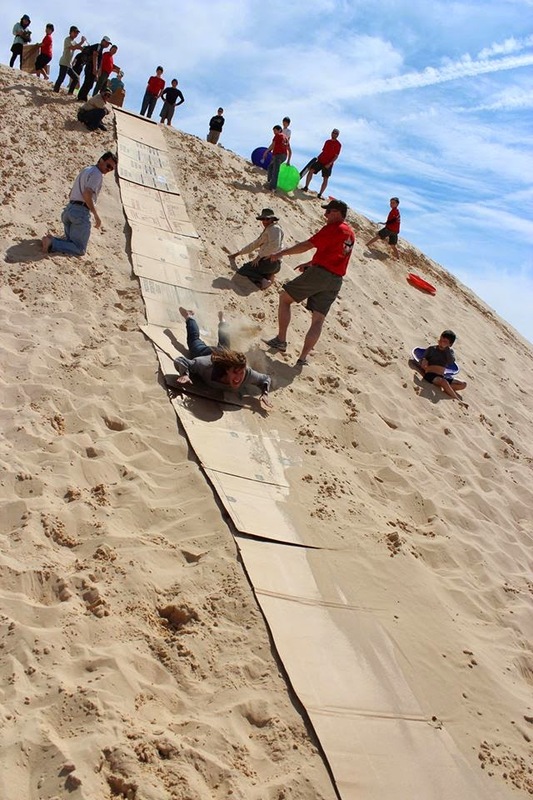 Monahans is known for - well - their sand hills: hills and hills of sand. You can camp at the park, but since it is really just a day trip from most other places in West Texas, you can also drive to the park from wherever you are headquartered and then drive home in the afternoon. We went here last year and had a great time, so it was fun to return with the troop. Both times we have visited the park, it was in the spring... which I am guessing is probably the best time to visit. I am guessing this place gets incredibly hot during the summer. But during the spring, the temperatures are perfect. If you have time, check out the geocache in the park. It took us on a wild adventure through the sand hills. One of the coolest parks of the trek was seeing all of the sand prints left behind by animals - snakes, beetles and even javalina! Make sure that you bring plenty of sun screen and water when you visit. And walking on the sand hills is more tiring than you might expect! We have never made to it Marfa to check out the lights, but if we return, it might be fun! Located off Route 67 is a viewing platform set up specifically for viewers hoping to get a chance to see the phenomena. Seen for over 40 years, the origin of these lights are unknown. The existence of them is also somewhat debatable ;o) But I have known people who swear they have seen them and cannot explain them. Whether you believe in the ghost lights or not, it sounds like fun to check out! Located just 12 miles south of Davis Mountains State Park and 45 miles south of Balmorhea is the McDonald Observatory. If you have a chance to make it here, it is will worth the drive! The visitor's center has a small visitor's center chock full of astronomy information. But the highlight of the place are the tours and the star party, if you can get in. They fill up quickly, so be sure to plan ahead and book your tickets. The daytime tour includes Solar viewing (not available on the cloudy day we went) and a tour of the Hobby Eberly telescope. We were all astounded to see this huge telescope, and the building that moves around it! We took the twilight tour as well. This was an educational program that takes up the time between the day viewing and the evening star party. This year, the Star Party was moved inside due to incredibly heavy fog. Instead the center offered a number of educational programs inside - or a rain check good for a return trip within two years. Since we were all incredibly exhausted, we decided to take a rain check. I am sure the evening program would have been worthwhile, if we could have stayed! However, last year, we went to the Star Party and it was really neat. They have a large number of telescopes set up outside, and you can walk around and view a variety of different astronomical bodies. Spring Break is the observatory's busiest time, so the night we went, there were 1,000 people in attendance. One piece of advice, it gets *cold* up on the mountaintop in the spring time. And I mean very cold. Last year we brought winter jackets... This year we brought winter jackets, hats and gloves. There are other places to visit in the area; Fort Davis, Big Springs State Park, Million Barrels Museum in Monahans, Odessa Meteor Crater and more! Or on the way home, stop at the Sonora Caverns!